The recent rebranding of the Centre for Waqaf Funding Development (PPPW) to the Centre of Awqaf and Zakat (PWZ) on 1st May 2017 is an indicator that the functions and missions of this department has greatly enlarged. The new funding resource of the University through waqaf has gained major attention from the Ministry of Higher Education (MOHE) as this is in line with the Ministry’s aspiration in encouraging public university’s creativity and initiative to self-sponsor their own expenses. The new funding resource through waqaf and zakat is indeed an Islamic channel of financial contribution and in fact, it leaves an in-depth spiritual effect to the contributors. Below is the interview report with the Director of PWZ, Assoc. Prof. Dr Wan Abdul Fattah Wan Ismail on the latest development of the centre. Q1 What is the new agenda or waqaf campaign that PWZ is currently strives on? “We are launching the campaign of Jom Berwakaf (Let us Waqaf). Waqaf that we would like to venture on is in the form of business, where it does not literally mean that buy and sell take place here. What we mean is a high impact and profitable marketing strategy that can give a huge return to the University. It is parallel with the Naqli and Aqli concept. I have to say that our society at large would associate waqaf to the development of mosque and the cemetery, whereas according the religion, the definition of waqaf is beyond than that. We actually aim to move further with the development of a community complex that will be well-equipped with a hotel of worth RM15 millions”. “We also would like to attract the non-Muslim to contribute through waqaf based on the ‘blessing’ (berkat) concept. Blessing is a gift from God and it is not limited to Muslim per se, and waqaf is a way of getting the blessing from God in our daily life. The understanding of through waqaf, God will definitely award us with goodness and prosperity in life is hoped can attract the non-Muslims to take part in this project. Therefore the theme of Jom Berwakaf Membawa Berkat is perhaps the most suitable theme to reach this potential contributor”. Q2 What is your opinion about the potential of waqaf in the development of higher learning institution such as USIM? “Waqaf plays a huge role in the development of higher learning institution. In my opinion, waqaf to the University especially, has a great potential. When we advertise waqaf through variety social medias, we can see amazing result out of it, as many come forward to show their interests in contributing to the waqaf development. Therefore, I am absolutely confident that the opportunity is getting bigger in the future”. “What can I say about the potential of waqaf in USIM is that we are very grateful to receive full support from the top management of USIM and the University Board of Directors. Our role is to empower the waqaf agenda more aggressively throughout the year. I myself have to constantly remind my staff on how to run the modus operandi of waqaf so that it can be widely spread to the community inside and outside USIM”. “From what can I see, the dissemination of information through WhatsApp application is very effective as we get prompt feedback once the message has gone viral. For your information, during the officiating of The Staff Assembly with the Vice Chancellor, PWZ has received RM 9,000. I am pretty sure that ion USIM, there are many individuals who would like to waqaf, but they do not know the proper channel to perform it. Alhamdullilah (Praise to Allah), so far we have received a huge amount of waqaf from salary deduction from certain individuals”. Q3 Is there any significant approach to accomplish the waqaf agenda in USIM? “In general, there are three approaches that we have planned to run the waqaf agenda in the university. Firstly, we are targeting the students. PWZ will hold meeting with students to involve them as a waqaf agent of the university. For instance, PWZ will launch Jom Berwakaf RM1 atau RM2 campaign and for each of the fund collected, we will create a waqaf chair on the name of that particular student itself. This will indirectly encourage them to contribute to waqaf”. “Secondly, PWZ will target the alumni through the collaboration with the Director of The Centre of Alumni and Career. About 14,000 USIM alumni that we have at the moment, PWZ will identify those who are still active and are willing to contribute through waqaf ”. “Thirdly, the waqaf campaign is launched to all staff through car sticker and PWZ hopes that all staff will have this sticker and display this so that the campaign can be disseminated widely”. 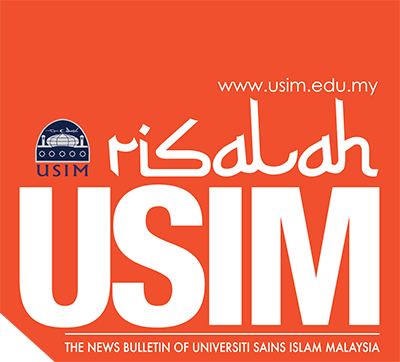 “On the other hand, in Malaysia, we have approached a number of banks and companies as USIM has many Syariah Advisors and we have encouraged them to run the campaign with us. For international level, the Vice Chancellor and the Deputy Vice Chancellor (Student Affairs and Alumni) has made official visits to Saudi Arabia and UAE. They have visited scholars such as, Dr Yusuf al-Qaradawi to seek for the appropriate waqaf channels”. Q4 How can the concept of Barakah Campus be associated in determining the mission of waqaf development in USIM? “In the era of the sahabah, waqaf is a big agenda but they manage to classify it into different terminologies such as Department of Finance. Nowadays we can see that waqaf plays a significant role to the country development and university has been encouraged to explore financial funding through waqaf. The misunderstanding that waqaf has to be in a big amount of money always make people stay away from waqaf, whereas the amount of money is not an issue here. Therefore, we have to clearly understand the concept”. “Among the key of blessings (barakah) is waqaf. We are discussing on how to make people feel the concept right after they step into the campus. How can we make the society confident to contribute through waqaf and ensure them that they can feel the effects? In this case, we release a letter of appreciation to the waqaf contributors and always keep them informed through monthly internal circulation to encourage them to further contribute and enliven the barakah concept. Inshaallah, I am again, very confident that the waqaf fund will gradually increase from time to time”.